It’s certainly no secret that I wholeheartedly adore Fall. The colors, smells, and textures make this season my absolute favorite time of year. Although I obviously love to bake regardless of the season, there’s just something really special about the intoxicating aromas and flavors of autumn spices. I have a bin of spices that I store in a cabinet above the refrigerator that is completely dedicated to fall baking. It’s brimming with cinnamon, cloves, allspice, crystallized ginger, cardamom – and that’s just naming a few. Towards the end of summer, I pull the bin down and conduct and inventory of my Autumn arsenal – I kind of have a quirky obsession with spices and spice organization. Too bad this “organization” only lasts for about 2 weeks, then I’m back to blaming Brian for hiding my whole nutmeg. I stumbled upon this recipe for Pumpkin Ginger Cupcakes about 6 months ago and tucked it away in a file folder on my desk. When I came across the recipe months later, I knew it would be absolutely perfect for the Spice Islands Holiday Recipe Exchange. Spice Islands is definitely one of my absolute favorite spice companies. I find them to of the highest quality and most flavorful spices on the market – and trust me I have tried a lot of different companies. And I have bulging cabinets to prove it! These Pumpkin Ginger Cupcakes are enthusiastically spiced, incredibly moist and just perfect on their own – in fact I ate them for breakfast! But we all know that I have a difficult time leaving well enough alone, so I just had to top them off with a swirl of Ginger Cream Cheese Frosting. 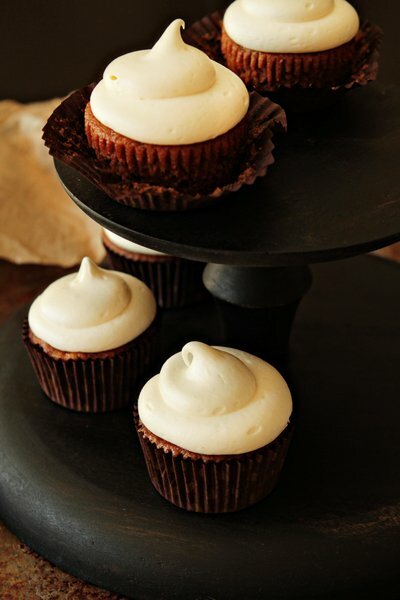 This little addition made these cupcakes my favorite new Autumn addiction! Now , we want you to share your favorite recipe using fall spices and be sure to head over to Good Life Eats, because Katie has a glorious recipe for Orange Spice Pumpkin Muffins waiting for you! 1. Preheat an oven to 350 degrees F. Line muffin tins with paper liners. Place crystallized ginger and water in Pyrex measuring cup and heat in microwave for 2 minutes. Remove from microwave and set aside. 2. In a large bowl, sift together the flour, pudding mix, baking soda, salt, cinnamon, ground ginger and allspice. Set aside. 3. In the bowl of a stand mixer fitted with the paddle attachment or in a large bowl with a hand mixer, beat the butter and sugars until light and fluffy, about 2 minutes. Beat in eggs one at a time until thoroughly incorporated. Add in vanilla and pumpkin puree beating until combined, scraping the sides of the bowl as needed. 4. With the mixer on low, gradually add in the flour mixture, mixing until just combined, scraping sides of bowl as needed. 5. Use a small mesh sieve to strain the ginger from the sugar syrup. Keep syrup for cream cheese frosting. Mince the ginger and use a rubber spatula to gently fold it into the batter. 6. Using a large cookie scoop (3 tablespoons) divide the batter between the prepared muffin wells. 7. Bake in the preheated oven for 20-22 minutes or until golden and the tops spring back when lightly pressed. Cool in the pans for about 10 minutes before removing to cool completely on a wire rack. 8. When cupcakes are cool, prepare the frosting. 1. In a the bowl of a stand mixer fitted with the paddle attachment, or in a large bowl with an electric mixer, cream together cream cheese and butter until well combined. 2. With the mixer of low, slowly add the confectioners’ sugar until thoroughly incorporated and smooth. Add vanilla and ginger syrup and mix to combine. Store cupcakes in the refrigerator for up to 2 days. Remove to room temperature one hour before serving. - Crystallized ginger is typically found in the spice of aisle of most markets. - Crystallized ginger is also sold under the name candied ginger - these two items can be used interchangeably. - If you prefer your frosting to be less sweet, decrease the amount of sugar to meet your needs. - I generously frost my cupcakes, if you prefer less frosting, start with 1/2 the frosting recipe. - Chocolate Brown liners were purchased from Bake It Pretty. - Cupcakes were piped using the Large Round Tip from Bake It Pretty. Write and post a recipe on your blog featuring FALL SPICES (cinnamon, cloves, nutmeg, allspice, cardamom, etc.). Include “Come join the fun at the My Baking Addiction and GoodLife Eats Holiday Recipe Swap sponsored by Spice Islands.” in your blog post. Submit your post before Nov. 9, 11:59 PM. What a great combination of flavors! I love that it has butterscotch pudding mix, I bet that’s great with the pumpkin and ginger! Jamie these look sooooo good! I love butterscotch; I bet these are amazing! Cake: Beat oil,sugar, eggs and carrots. Add remaining ingredients. Pour into well greased and floured 13 x 9-inch cake pan. Bake in preheated 350 deg oven 30 to 35 min or until cake tests done. Frosting: Mix butter , sugar, milk, vanilla and egg yolks together over medium heat until mixture thickens, about 12 min. (use true evaporated milk, do not use non dairy milk) Add coconut and nuts.Beat until cool and spread on cake. This looks SO YUM!! I have to bookmark this recipe! This look so festive and amazing! Wow – these are stunning! I think the delicious spices of fall is what I miss most….I’m allergic to cinnamon and allspice, so I lost a lot with that. However, I’m very happy to drool over these PERFECT cupcakes and admire your talent! These cupcakes are devine. Beautiful recipe! I have the Morris kitchen Ginger syrup and made muffin versions of this, not knowing a cake recipe existed. Bookmarked! Their syrup is my favorite secret ingredient! I adore fall as well and I love baking most during fall because everything has this warm fall smell to it. This is delicious looking and I can’t wait to try it! These look lovely! Great combination of spices, I bet they are so flavorful! 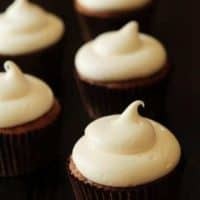 My favorite recipe is a comfort food from tammysrecipes.com. It’s her breakfast oatmeal- absolutely yummy! I usually add nutmeg and allspice. I’ve made a similar recipe but not with ginger…which I love so will have to try this. I’ve been making drinks with ginger ale; good ginger ale. The difference I’ve found when it comes to ginger is so evident whether spices or beverage…the good stuff makes all the difference. I love the idea of adding Crystallized ginger to your icing – – cream cheese icing is my absolute favourite icing and I’m sure if given the opportunity I can eat it by the spoon full – but I think the ginger would add another dimension that would make it simply irresistible. Oh my… these look heavenly!!! Cinnamon, cloves & nutmeg are my favorite fall spices so here is one of my favorite recipes with all 3…. Heat oven to 350 degrees. Grease 12 cup bundt pan or 9” x 13” pan. Whisk sugar, applesauce, oil, eggs & vanilla in large bowl until smooth. Stir in flour, baking soda, salt, baking powder, cinnamon, nutmeg & cloves until blended. Stir in raisins and walnuts (optional). Bake 45 to 55 mins. Spiced Apples & Raisins..perfefct with pan-seared pork chops! Thanks, Tyler Florence! 1. Melt butter in a skillet over medium-low heat. Add apples and thyme, coating with butter. Cook and stir for 8 minutes, to give them some color. 2. Toss in the raisins. Add the apple juice concentrate, stirring to scrape up the brown bits. 3. Stir in the brown sugar, cinnamon, coves, and dry mustard. Season with salt and pepper. 4. Squeeze in the juice from the lemon and simmer for 10 minutes, until apples are softened. 5. Spoon over pork chops. I love those fall spices especially ginger! I could put ginger in just about everything. I like to change up the typical Snickerdoodle cookie recipe. When it comes time to roll the cookies, instead of just cinnamon and sugar, I like a blend of sugar, cinnamon, a little nutmeg, and ginger. Sometimes, not always, I’ll add just a dash of chili powder. It gives it more kick than normal, and not everyone likes it. But so far it’s a hit at most parties. These cupcakes look absolutely yummy. I would like to make them but as I live in the UK I cannot say that I have seen any form of Butterscotch Pudding Mix. Do you have any idea what i can use as a substitution without compromising on the taste? Such a great fall/holiday recipe! You are now and will forever be……MY HERO………THANKS!!!! These cupcakes are delicious!!!!!! I made three batches within just a few days. I got so many compliments on them. Thanks so much for sharing! This is so good. Best cupcake I’ve ever had. I’m also interested in butterscotch pudding substitute? Thanks for stopping by! Unfortunately, I don’t know the exact proportions of substituting fresh ginger. Personally I would just grate a little in and keep tasting until it was perfect. Best of luck to you! Have a great day. I just made these cupcakes for my son’s 1st birthday party which was yesterday 9/15 loved them and made them with a cream cheese frosting. I happened upon this recipe on http://www.allrecipes.com. These cupcakes are absolutely delicious!! Glad to hear that you enjoyed the recipe – thanks so much for visiting an leaving your feedback! Have a great day. I made this as a cake (2 8-inch pans) and subbed an egg yolk (put in with the other eggs) about 1/2 cup powdered sugar (with the dry ingredients) for the pudding mix and it worked out wonderfully. I also ran out of vanilla making the cake, so put a teaspoon of rum in the frosting instead and it was great as well! Can’t go wrong with rum. I only used 1/2 the amount of frosting. These look awesome! Question, in the recipe it calls for 1 cup butter. I just wanted to double check, but that would be unsalted butter? Thanks! Yes, I typically use unsalted butter. Thanks for stopping by – I hope you enjoy the recipe. I made these thinking that I would be the only one in my family who would like them because I am typically the only one who loves ginger. They were gone in two days! Everyone absolutely loved them. I am going to try substituting the butterscotch pudding with the new limited edition pumpkin spice pudding that I found at Walmart. My icing came out rather thin (not sure why) but still tastes wonderful and a little icing is enough for us, so it works. I am so happy to hear you enjoyed the recipe – thanks so much for stopping by and leaving your feedback! Have a great weekend. Jamie – These cupcakes look scrumptious! I love the simple way you frosted them. I’d like to bite a cupcake right through my computer screen! 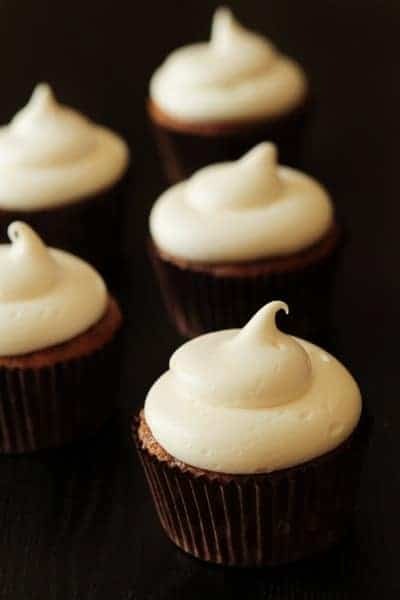 What frosting tip number do you use and what manufacturer? Hi Cheryl, as it says at the bottom of the recipe, cupcakes were piped using the Large Round Tip from Bake It Pretty. Thanks for stopping by! Fabulous recipe. I made these for Christmas last year, and people were practically smuggling them home. 5/5 stars! Making them again this year as gifts. I’m glad the recipe was such a success for you. Thanks for visiting!